Buildings at 104 and 108 E. Beaufort St. in Uptown Normal will be demolished to make way for the Trail East development. Council members unanimously approved an agreement with developer Bush Construction on Monday night to build a five-story mixed-use building and private parking lot at the Trail East site on Uptown Circle. The building will be the fourth of five included in the Town’s 2000 Uptown Renewal Plan. The town completed the Children’s Discovery Museum in 2004, Uptown Station in 2012 and One Uptown Circle in 2017. While Bush says it can cover about $25 million of the project cost, the town will pick up the remaining $4.2 million with Tax Increment Financing (TIF) money. The town created the Uptown TIF District in 2003 to help fund the plan and approved a 12-year extension in May. "This is an opportunity for us to really diversify and be more proactive and forward-thinking in our employment base." The town estimates rebates paid out annually over the life of the TIF will have an $8 million total value. Normal will also cover the cost to relocate utilities for some properties along East Beaufort Street, provide off-site parking at a reduced rate, and waive various development and permitting fees. It will also sell the land, valued at about $1.2 million, to Bush for $1. According to City Manager Pamela Reece, these kinds of incentives are nothing new. “All of these commitments that we’re proposing in the redevelopment plan are things we’ve seen in the Uptown Renewal process,” she said. Reece and council members said they were confused after former Normal mayoral candidate Marc Tiritilli accused the town of diverting money from Unit 5 schools to fund the project. Reece also noted the town sought official approval of all affected taxing bodies, including Unit 5, before extending the TIF. Tiritilli later clarified he was talking about property tax revenues lost when the town bought up land as part of the Uptown Renewal. Reece said the Uptown Renewal process is a prime example of what public-private partnerships can accomplish for the whole community. In the 15 years since the town began work to implement the plan, “we have invested about $90 million or so in public funds in the entire Uptown area,” she said. The site also lies within a state-certified Enterprise Zone, making the developer eligible for incentives like a sales tax exemption on building materials and a 0.5 percent state investment tax credit. Even with the enterprise zone and other incentives, the developer still needs TIF dollars to make the project viable, meeting the town’s “but for” economic development guidelines, according to a staff report. Plans for the site include the demolition of two historic buildings at 104 and 108 E. Beaufort St. to make way for the new building and provide access to a private parking lot. When the structure at 104 E. Beaufort St. is razed, a beloved community mural will go with it. The town leased the building to local artist Natalie Wetzel and her business partner, who opened their store The Pod in 2011. The owners worked with the town to coordinate local residents to paint a community mural on the side of the building. Featuring the work of around 50 local artists, the mural has been photographed countless times over the years, serving as the backdrop to special events and a point of interest for visitors. As word of Bush Construction’s plans for the site got out, community members rallied to save the mural and historic buildings they said give Uptown its unique history and charm. But staff insist preservation is not a viable option. The town estimates 104 E. Beaufort St. alone would need $400,000 of work before it could house another tenant, including necessary tuckpointing that would destroy the mural anyway. Residents also lamented the loss of the public Trail East parking lot if Bush's plans were approved. Under the redevelopment agreement, the town will offer 300 parking spaces throughout Uptown to accommodate employees at the new building. But according to a staff report, the lot would need some work to level the surface and reroute power lines running along the alley and through sections of the lot. There’s also ample opportunity to make up the lost spaces elsewhere, the report adds. 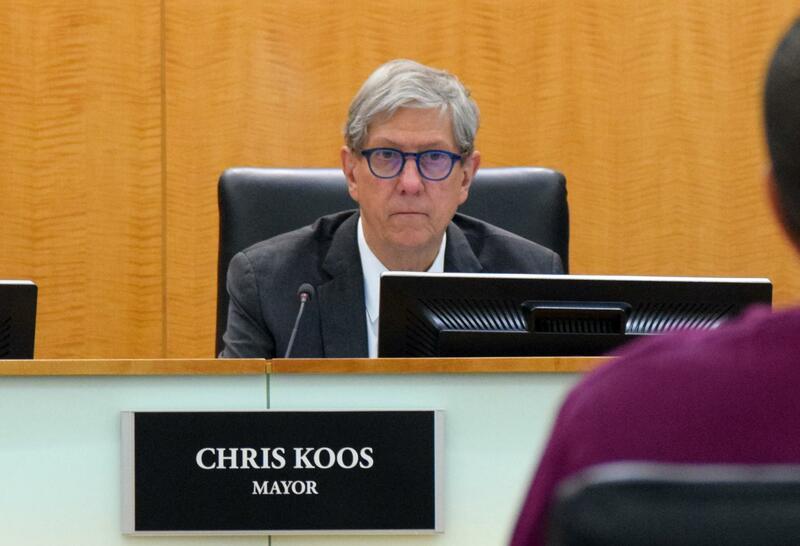 Normal Mayor Chris Koos insists the losses, while significant, help pave the way for a more vibrant Uptown. Local engineering firm Farnsworth Group plans to relocate its corporate headquarters to the new Trail East building, while the town reports Bush Construction has commitments from other tenants to occupy around 70 percent of the building’s remaining leasable space. The first floor will house retail tenants and a food hall, and the fifth floor will include nine market-rate apartments. The town estimates the project will also create around 200 construction jobs. Koos said all those new employees and residents will have a significant economic impact in Uptown. Council member Kathleen Lorenz contrasted that prospect with the reality in neighboring Bloomington. Koos said the loss of public art is an issue that won’t drop off the town’s radar. He said he’s already held two meetings with the director of Illinois State University’s School of Art and the school’s director of fine art to talk about bringing more public art to Uptown. He also said Normal hasn’t lost its commitment to historic preservation. “There were millions of dollars spent in the process of Uptown Renewal saving and rehabbing historic buildings,” he said. By his count, 22 Uptown buildings along North and East Beaufort streets received public dollars for restoration. “So the Town of Normal does take very seriously its historic assets in this community,” he said. Following approval from the Uptown Design Review and Historic Preservation commissions, construction is expected to start late next spring and last about 14 months. Normal Town Council member Jeff Fritzen said Monday he won't run for another term.